Objects and Material Things II: Souvenirs and Collecting | Amber Regis :: "Looking Glasses At Odd Corners"
Last week I blogged about two very different life-narratives emerging from two very similar items: Victorian decoupage screens — one created by a man, Charles Dickens, and the other created by a woman, Jane Welsh Carlyle. In turn, this was cited by Charlotte Mathieson, an early-career researcher at the University of Warwick, in a post exploring literary tourism in the run up to Dickens’s bicentenary in 2012. Mathieson argues for a similar process of storytelling at work in human interactions with place/space. In the case of Dickensian tourism, “[London] is experienced like a material object”: its streets and buildings seem to offer “a physical manifestation” of Dickens’s life and work. Thus, in engaging with the city, the Dickensian tourist seeks an “authentic connection” to author and text. Mathieson is rightly sceptical and she warns against simplistic readings that conflate “real and represented places/spaces”. Nonetheless, the phenomenon is intriguing and Mathieson’s discussion of tourism puts me in mind of one further category of material object: the souvenir. Souvenirs often depend on life-narratives for their resonance and meaning(s). In turn, their collection and arrangement can produce life-narratives of their own (a form of self-curation on the part of the collector). 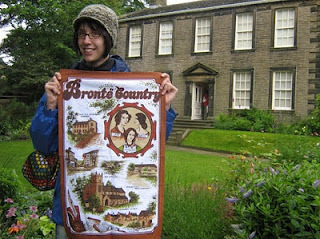 The rather embarrassing Brontë tea-towel I am clutching in this photo, complete with Haworth parsonage in the background (with modern extension cut out of shot), will serve as an example. Why did I buy that tea-towel? Putting aside any claims I might make to ironic purchasing — to a self-conscious seeking out of tacky/kitsch items — my selection of the tea-towel was first and foremost the result of my interest in the life and works of the Brontë sisters. But you’ll not be surprised to hear that little can be gleaned on either count from the tea-towel itself — I was already aware of the sisters’ names and the places they inhabited, and the tea-towel told me nothing at all of their works! But I purchased it anyway, and it seems to me the only reason I did so was to take a piece of Haworth away with me: a physical reminder; proof (if proof were ever needed) of my visit and of my own presence in the spaces previously inhabited/experienced by the Brontës. It is particularly apt, in the light of Mathieson’s post on Dickensian tourism, that the tea-towel is primarily concerned with place. And one can safely assume that the manufacturer is targeting an audience who has visited these places (on some form of Brontë pilgrimage). As souvenir, therefore, it seeks to preserve that interaction with place/space described by Matheison; it becomes the material trace or remnant of that hoped-for “authentic connection” with text and author. But surely the tea-towel also says something about me? (And I would ask you to be kind…) Again, you’ll not be surprised to hear that I own several other items of a ‘literary-touristical’ persuasion. 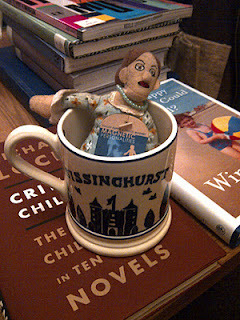 I have a mug from Sissinghurst Castle, home of Vita Sackville-West; I have pencils and pens from several writers’ homes now in the possession of the National Trust; I even have a Virginia Woolf fridge magnet. It’s quite a collection, and one that continues to swell. In their accumulation and combination these objects cease to tell stories about their subject alone, and begin to tell stories about me. In her work on collecting, Susan Pearce views souvenirs as part of “our attempt to make sense of our personal histories”: their collection is thus representative of our efforts “to create an essential personal and social self” . 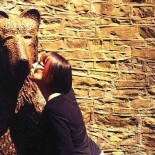 Souvenirs, therefore, are aids to self-fashioning. Tea-towel, mug, pencil, pens and fridge magnet all serve to ‘narrate’ my interest in nineteenth and twentieth-century literature; they help to construct and reinforce my sense of self as a literary critic and book lover. But, to end with a question, is the self of my souvenir collection any more or less authentic than the engagement with author and text promised by literary tourism, by walking the streets of modern-day London in the footsteps of Dickens and his characters? Susan M. Pearce, ‘Collecting reconsidered’, in Interpreting Objects and Collections, ed. Susan M. Pearce (London: Routledge, 1994), pp. 193-204 (p. 196). Looks like this is the place to psychoanalyse memorabilia. When me and my fiancée went to Lyme Park, she bought a Mr. Darcy mug from the gift shop. I tell myself that I don't like it because it can't go in the dishwasher and is constantly in the way, but I fear it might really be because I know I'll never look that good in a cravat. Bob, I'm sure you look dashing in a cravat (not to mention a top hat…)!Intriguing that Lyme Park is capitalising on the BBC adaptation in the same way that writers' homes capitalise on former inhabitants. It's like literary tourism once removed — the souvenir of the adaptation of the writer's work! Pingback: On Academic Blogging « Amber Regis :: "Looking Glasses At Odd Corners"
Pingback: Blog in the News: On Self-Promotion and Networking « Amber Regis :: "Looking Glasses At Odd Corners"
Dear Amber, this is fascinating. I just read your fantastic blogpost on ‘Placing the Author,’ and followed the link at the end of it to arrive here. I am amazed at how our WordPress themes are the same, how our blogs look similar only yours is supremely intellectual and artistically brilliant, standing in no comparison to mine – content wise. My literary souvenirs list is too long but I will tell you that my heart broke when the Shakespeare mug broke. I still slip into depression each time it comes to my mind – the price we souvenir lovers pay. I just bookmarked this site and hope to return to it more times than usual, hopefully it won’t be mistaken as ‘stalking.’ You are perhaps going the PTA conference on June 20? Congratulations! I wish I could too. This entry was posted on December 4, 2011 by AmberRegis in Anne Bronte, biography, Charles Dickens, Charlotte Bronte, collecting, Emily Bronte, material culture, objects, Souvenirs, tourism.